Pick The Best Pellet Smoker & Grills From Trusted Reviewer. Do you like to smoke or grill food but just can’t seem to find the time or patience actually to participate in the cooking process. Maybe you are inexperienced with smoking or grilling and would like to learn more about it. Well, look no further because using the best pellet smoker will help you achieve all of this and a whole lot more. A pellet smoker/grill will aid in helping you cut out all the extra work that goes along with grilling or smoking foods. In this article, we will cover everything you need to know about a pellet smoker from how to purchase one all the way up to smoking foods using your pellet smoker. We will also cover the best pellet smokers available on the market today and give a little insight into each one. How to choose the best pellet grill? When choosing a pellet smoker, it is best first to figure out what your needs are. Also, you may want to consider your experience with smoking or grilling because some models are so easy to use, you don’t have to do anything but set it and forget it. If you are a more hands-on type, spring for a pellet smoker you can easily interact with throughout the cooking process that allows you to adjust temperatures, heat and moisture levels. What are the advantages of having a pellet smoker? A clear advantage of the pellet smoker is the easy to use interface that can do all the work for you. Allowing you to free up some of your precious time to do other things around the house or just hanging out with friends and family. Most pellet smokers are so user-friendly they can be operated from afar using Wi-Fi, an app or with a Bluetooth connection on your phone. A pellet smoker is also energy efficient using very little electricity or propane as the power source and a very small number of pellets for the heat source. Things to look for when buying a pellet smoker? Always try to look for a pellet smoker that has a nice solid construction to stand up against weather and time with a great user interface to control the smoker. The more options available, the better. Make sure and do the research and read reviews about each one before springing for a very expensive model you know very little about. What a must have with these very expensive machines is making sure the product comes with a fully covered warranty or at the very least a manufacturer guarantee with positive testimonies. A pellet smoker uses either direct heat, indirect heat or both. All are different, so make sure to buy one to fit your needs. The most popular design would be the indirect heat style consisting of a chamber to place the food you intend to cook and a hot box attached at the side which contains the heat source. Connected to the hot box is a “hopper” which holds the pellets and distributes them into the hot box based on a program you set to tell the machine when to add more. You can also add them manually, but it is best to let the machine do what it is designed for. The pellet smoker can maintain very specific smoke, temperature and moisture levels you pre-set according to the food you intend to cook. Say you want to cook a 5-pound pork shoulder. All you need to do is place the meat in the smoking chamber, fill the hopper with wood pellets and set the program on the user interface for 8 hours at 200 degrees. You will sometimes have the option to choose the density of the smoke to be maintained and the amount of moisture within the smoker as well. Then press a button and let it do its thing. You can monitor the smoker from a remote or your phone to make sure everything is going ok without having to go to the smoker and check your food, comprising the heat and smoke within. Pellet smokers are not for everyone. These machines are intended to make the cooking process seamless with little to no interaction needed. Some people prefer to cook the food themselves without having a machine do the work. This is all ok; it just depends on what your needs are and how experienced you may be. But in the long run, a pellet smoker will deliver an equally if not better end product when compared to other smokers. This pellet grill and smoker does not come cheap, but regarding pellet smokers, it is on the more affordable side. This is one of the top-rated pellet grills on the market today with plenty of good reviews to back it. The hopper has a digitally controlled interface that makes it easy to load wood pellets and set the standards, time and specifications for the cooking process. Then with the flip of a switch, you are off to cooking, hands-free. The body is well designed but the materials have been known to be flimsy or of lower quality making them dent and bend easier. The pellet grill will also take some assembly which has instructions provided for you through a YouTube video. Some have said that the assembly video and process is not a fun experience since it takes extra-long to set it up and sometimes has missing parts or pieces that don’t fit well. The pellet grill is equipped with a digital read thermometer which makes reading temperatures easy. There is also the adjustable flu on top of the smoking chamber which allows the flow of smoke and excess heat. There is patent ash clean out system improvised on the hopper which makes cleaning easy with just the pull of a lever. The hopper has also been known to be easy to use but has provided some problems for many when trying to retrieve pellets from within it. With 429 square inches of cooking space area, you can cook a multitude of foods for your family or a large gathering of guests. This would make a great smoker for the guy who wants to get into smoking. Not a whole lot of extra features on it but it does contain everything you would need to know how to smoke anything. This smoker is very similar to the one above but is also a bit more affordable. While it also may not have the gadgets and extra features, it will still produce a quality end product if you treat the grill with care and respect when using it. The pellet grill is well constructed of heavy duty 16-gauge steel and coated with porcelain enamel to protect it from rain and other harsh weather conditions. It also a has s side attached flu which is adjustable and works just like a damper to release or keep in any excess smoke or heat. While this pellet smoker is quite heavy, it does come with two roller wheels to make it easier to move around. The other two legs are made of sturdy, heavy galvanized steel. 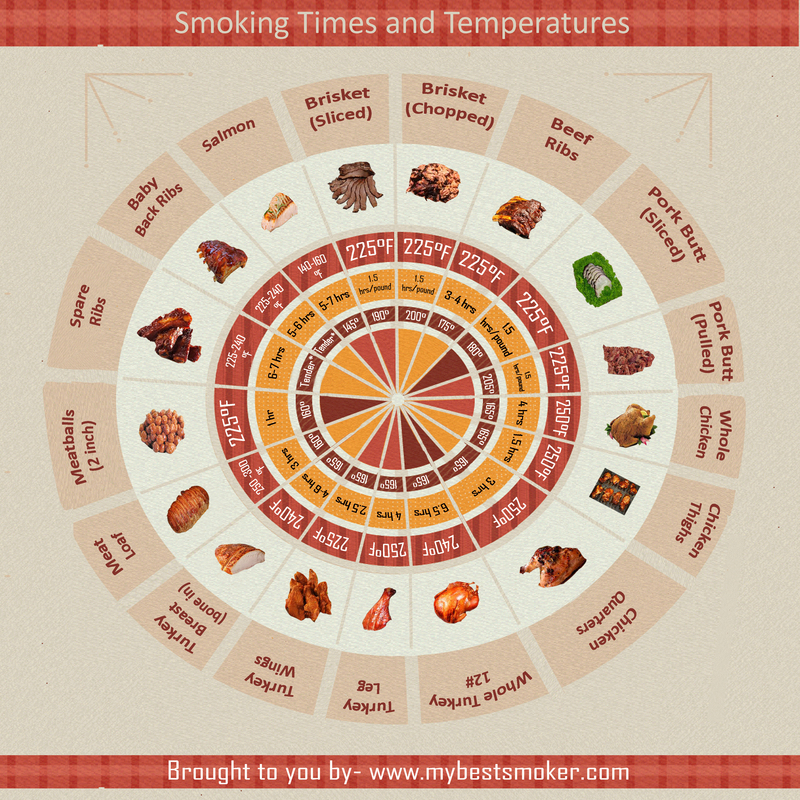 There is an internal thermometer included in the smoking chamber, but there have been complaints of it not reading accurate temperatures, but this is pretty common in just about any smoker you buy. In all reality, you will almost always want to purchase a secondary, much better thermometer to attach to your smoker or grill. This smoker is one of the more affordable on our list, and we wanted to place it on here to show you the versatility of all pellet smokers. However, this smoker has had plenty of bad reviews from customers, more than usual, making us raise an eyebrow. There have been problems with the heating element burning out very quickly as well as the hopper stop working or not work at all, to begin with. It would be great for someone who knows what they are doing already, have the patience and ability to take care of it and clean it regularly. Also, if you are on a budget, this may be another choice to look at. Now here is a quality piece of machinery! 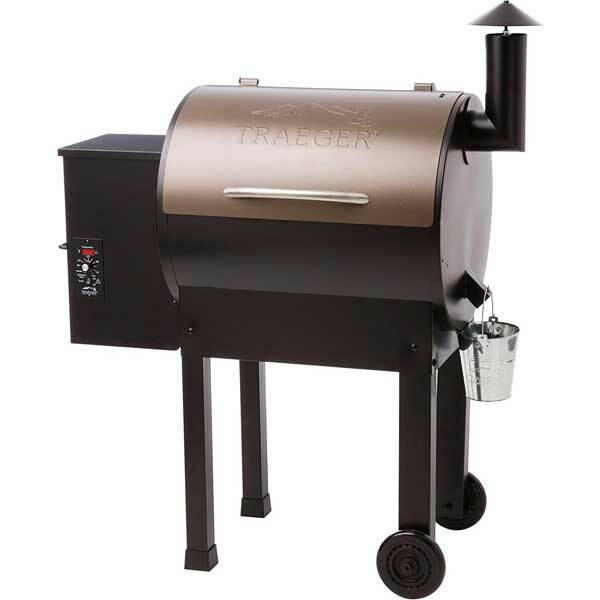 This pellet grill/smoker is made by none other than Traeger, who had the original patent on pellet grills for 20 years before being released to the public. These people have been making pellet grills longer than anyone else in the market and knew their stuff. This grill does not come cheap; in fact, it is one of the more expensive models available. But it does have some great features available with it. With its well-constructed body of industrial steel and a powder coating to protect it from all-weather elements. There is an adjustable flu attached at the side of the smoking chamber; easy ash pulls out cleaning system, cool to touch handles and two wheels on two of the legs making it easier to move around since it is quite heavy. The pellet grill has a very large cooking surface area of 420 square inches making it great for any backyard barbeque or large party. The grill grates are made of enamel coated porcelain making them very easy to clean. There is not much else to be said about this smoker considering it has been a well-trusted brand for 35 years. However, there is no warranty with the products, and they are non-returnable. In some instances, people have said the dimensions did not meet the ones listed, saying it was much bigger. But that is a small problem to have. This smoker would be great from anyone from beginner to pit master. This is a very interesting pellet smoker with some cool features. It is also very affordable being at the cheaper end of the spectrum. The coolest thing about this smoker is that it is portable or easily moved. This is a good thing and a bad thing at the same time. The body is constructed of lightweight quality materials so that is may be moved easier. While that does lose some overall weight, it also compromises the actual structure of the smoker while in use at high temperatures and weather elements. The legs are also collapsible or to be used s handles for carrying your pellet smoker. While this is also a cool feature, it also means the legs are not sturdy and are more the material and composition of a lawn chair. There is also a stainless-steel rack attached at the side for extra space as well as the flu or damper attached at the side to help relieve smoke and heat from the smoking chamber. This smoker can be operated completely from your smartphone using Bluetooth which is pretty cool considering the other models didn’t have this feature. The controls are all still digital, and the smoker is powered by either a 110-volt electrical outlet with a cord or by a small portable 12-volt battery. The point of this smoker is a convenience; its main objective is to make it ideal for camping or tailgating. While you do receive cool features, you do compromise on value as well. However, at the price and the convenience it provides, we think it is worth the buy. Last but not least, the crème de la crème! This is one of the best pellet smokers we have seen in a while. It has everything you could want in a pellet smoker and more. This pellet smoker has a massive cooking surface area of 513 square inches with an additional second rack with a cooking surface area of 187 square inches. You would be able to feed a small village or army with this bad boy, or at least 30 people will be well fed at your backyard barbeque. It is well constructed of strong powder coated steel materials and has the flu constructed into the top to adjust the smoke and heat flow. The hopper attached at the side is twice the normal size of other pellet smokers being able to hold up to 20 pounds of pellets at once. There is also an easy to clean ash pull out the system and a double door storage box at the bottom of the smoker to store all your tools and fuel. This product has a cover that is sold separately, but you should buy it to protect your grill from weather elements. There are also four locking castor wheels at the base of the unit making it easy to move the unit around. The easy to use digital interface is also unique in the sense you can control the setting and adjustments of temperatures from your phone using Bluetooth. This great pellet smoker does not come cheap whatsoever. But this has it all, every feature you could want as well as some extras that may surprise you. This pellet smoker has all the bells and whistles to make it shine! Are pellet smokers a newer technology? You would think so, but it is not. Pellet stoves and ovens have been around since the 70’s and used by many in times of low heat resources. Traeger grills were invented in 1986 and had a patent on the style for 20 years. In 2006, the pellet smoker patent was lifted, and the market was flooded with new and interesting models from several different companies. How long do smoker pellets last? This depends on the type of cooking you intend to do as well as the pellet smoker you will use. But generally, if you intend on smoking at a very low temperature, then 1 pound of pellets will last about 1-2 hours. If you plan on grilling with the pellets over high heat, then 1pound of pellets will usually last about 15-20 minutes. It best to have more pellets than you need just in case you run out or run into problems. Make sure to also store your wood pellets in a cool dark place to avoid mold and moisture build up. If treated and stored properly, your pellets will last forever. Is there a difference between pellets used for a grill versus used to heat a home? Yes, there is a huge difference. You do not want to use these pellets interchangeably. When using a pellet smoker make sure to purchase pellets used to smoke food, the others will contain chemicals and harsh materials that will not only ruin your food but also have the potential to make you very sick. Can I use wood chips in a pellet smoker or use pellets in a wood smoker? While you may be able to use wood pellets in a smoker, you cannot use wood chips in a pellet smoker. However, you will not want to use wood pellets in a wood smoker simply because they are not designed for that kind of smoker. It may work but you will need an incredible amount of pellet to do so and will end wasting a ton of money, time and patience. Can I use a pellet smoker inside? No. Pellet smokers are intended to be used outside only. They can reach high temperatures just like any other grill or smoker and will also emit dense smoke during the process. For safety sake reasons, all smoking and grilling should be done outside and treated with care and responsibility. So in conclusion, what is the best pellet smoker to purchase? Well, if the price is not an issue, then we say buy the Z Grills Wood Pellet Grill & Smoker because it has all the gadgets you could want in a smoker. This smoker also comes with a lifetime guarantee covering 100% of the equipment. If you are looking for more convenience or trying to save a buck, then we suggest you spring to purchase a Green Mountain Grills Davy Crockett Pellet Grill. This grill is perfect for taking with you anywhere. While it does compromise on the construction, it makes up for it with all the cool mobile and remote functions it has. Either way, both would be great pellet smokers, make sure you know what you need is first then everything else will take care of itself, just how a pellet smoker works.